Alvin Aaron Coffey was born into slavery in Mason County, Kentucky in 1822 or 1824 (sources differ). He persuaded his fourth owner to allow him to emigrate to California, where both men believed it was possible for Coffey to earn the $1,000 needed to purchase his own freedom ~ which he did. Over time, Coffey earned the additional $3,500 required to free his wife and children as well. The Coffey family settled in Shasta County, homesteading a small plot of land. 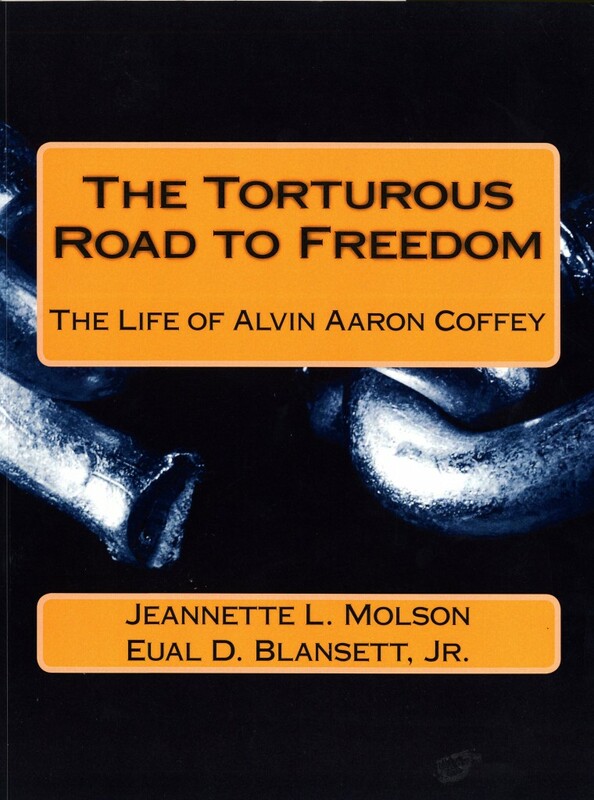 His unique and fascinating story is told in The Torturous Road To Freedom; The Life of Alvin Aaron Coffey by researcher Eual D. Blansett, Jr. and Jeannette L. Molson, Coffey’s great-great-granddaughter. 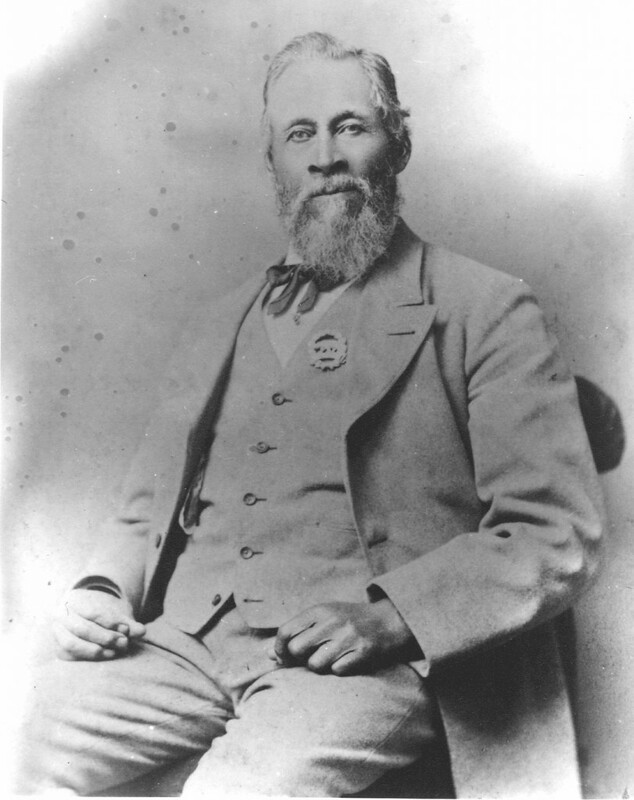 Coffey was an original member of The Society of California Pioneers; notice the pin on his vest in his portrait (above). His contribution to our archive of members’ autobiographies and reminiscences provides a rare, first-person account of an African American pioneer: read Coffey’s reminiscences, in his own words. 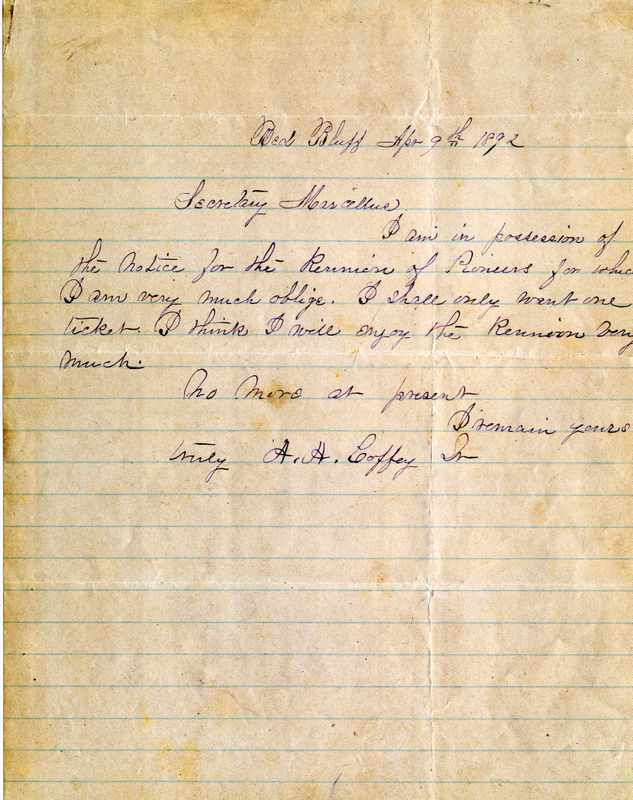 This was one of several documents in our collection that provided Blansett and Molson direct access to detailed information written by Coffey himself. 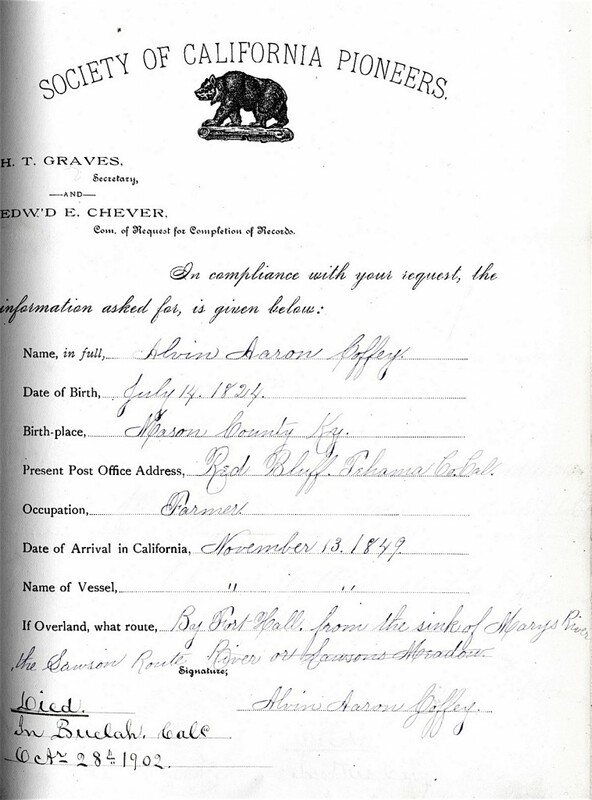 The page below ~ from our earliest membership records ~ confirms several details of Coffey’s life, including the pre-1850 arrival date that qualified him for membership in The Society of California Pioneers. 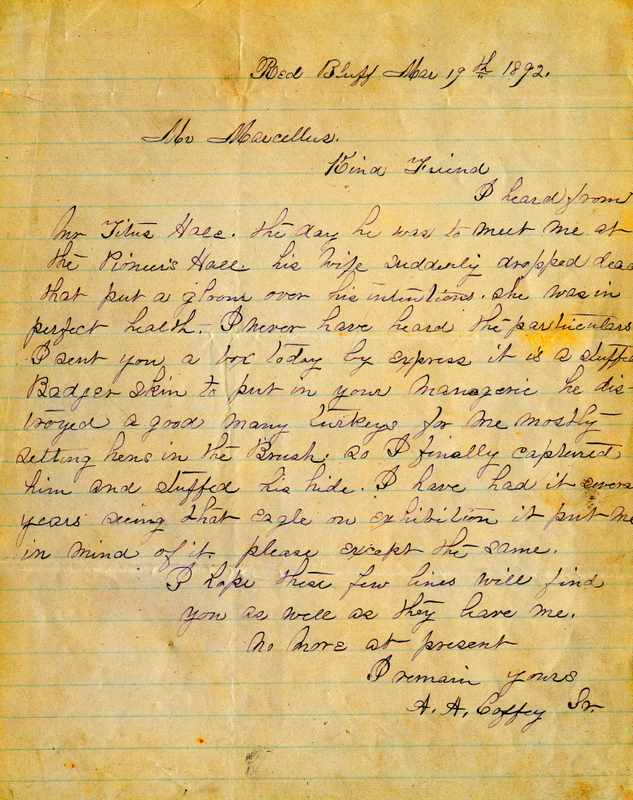 Also from our archives, Coffey’s handwritten 1892 letters to The Society (below) might add little to our understanding of his daily life but do offer an opportunity to see documents written by Coffey himself. Coffey’s reference to Titus Hale in the first letter hints at his acceptance within our organization (Hale served as president at the time). Coffey came to California in the 1849 wagon train led by Israel Hale, Titus’ father (who documented their crossing in his diary, also in our archive: learn more about the Hale diary). In the second letter, Coffey graciously accepts an invitation to a Pioneer Reunion, confirming a certain status in early California society. There are, however, documents in our collection that paint a darker picture. Found glued into a scrapbook of miscellaneous newspaper clippings, one sobering article (below) is not an obituary per se but reads as one. The sensational, insensitive headline coupled with references to “The Home for Aged Colored People” reminds us of the unique challenges Coffey faced. There is ample evidence to dismiss this report as scurrilous. Coffey was examined by E. A. Kelly and J. E. Kelsey (doctors who served as “lunacy commissioners”), found to be of sound mind, and not a fit subject for an insane asylum. Under their authority, Coffey was discharged and his name cleared. He died on October 28, 1902. Blansett and Molson’s self-published book on Coffey (available here) is a compilation of their impressive research in our Alice Phelan Sullivan Library and elsewhere, as well as a prime example of how artifacts are very often treasured by a family long before they become important to historians. 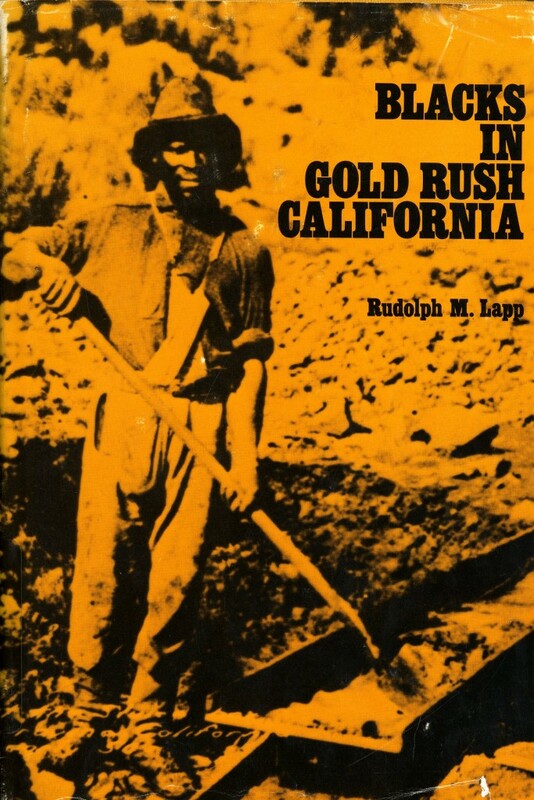 We also recommend Rudolph M. Lapp’s Blacks in Gold Rush California; it features additional information about Coffey, as well as other African American pioneers.